Why do we all like the Internet? What can you do on the Internet? In my opinion, the Internet embodies everything that humans as a whole think. The Internet is the world's largest hub of information, many times greater in number of pages than the congressional library, many times more popular than soccer, many times more frustrating than a Chinese finger-trap. Frustrating? That can't be right, can it? The Internet was made to simplify everyone's lives and how can it complete that endeavor if it's not simple enough for everyone to access it? To tell you the truth, 3 years ago, I thought we would be technologically advanced enough to deploy massive, citywide wireless Internet access that everyone could access with just a simple PCI card you can buy at the local store. Sadly, that isn't a reality. But we have progressed tremendously in the past 3 years, going from 28.8 modems, to 56k modems, to Cable/DSL. With some thought, one could say that the Internet is easier to access now than it has ever been before. As the world becomes more enthralled by networks and computers, there will be a big boom in the networking market as more people purchase computers. There will be a huge demand for faster Internet access; there will be a massive demand especially for products that will simplify everything. What am I getting at? Wireless. The el facto talk of the town for the past decade. Wireless technology is the apex of technological evolution. Think, if everything was wireless, how could you make it better? Everything we ever knew about the future embraced wireless technology.. Star Trek, did you EVER see wires in an episode of Star Trek? No, how about the company roadmaps of D-Link, 3Com, Linksys, etc… wireless dominates. Before you pass off my theory as bull, there are some things that will probably never be wireless such as RAM, processors, video cards, etc. There will be no Intel Pentium V featuring a wireless motherboard interface. I'm off to a bit of a rant here so I'll just get on to introducing the product we have the spotlight on today. 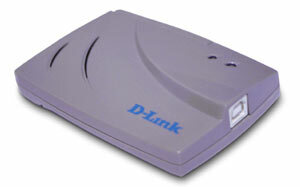 From D-Link today, we have their new USB Wireless Network Kit. Although I was a bit hesitant on reviewing it, it turned out to be one of the best pieces of hardware I ever tested and used. The great thing about networking is the cross-platform compatibility. Several boxes with different OS's can communicate with each other regardless of their specs or contents. For the test, I set up the wireless AP in my living room with a connection to a D-Link switch in port 3 with 2 other computers connected in ports 1 and 2. A DSL modem is connected to the uplink port on the switch. In the directions, it says to make sure that the AP and adapters are a good few feet away from components that might cause interference such as a computer or a monitor. After installing the Access Point, I powered it up and went to install the wireless adapter in my sister's computer in her room about 125 feet away. There are about 3 walls to get through to get to her room so this is a good testing environment. The 3 computers all use different versions of windows. There was one with Windows 2000, one with Whistler Beta, and the other with good old Windows 98 (sister's PC). Installing the Adapter was a snap but I made a mistake. In the directions, it said to install the software before plugging in the hardware but I did it the other way around (guess that's what instructions are for). Surprisingly, the adapter fired right up and worked anyway. Just to avoid any mistakes on my part, I uninstalled and reinstalled the drivers and software the correct way. Once the installations were complete. I restarted the computer and fired up Internet Explorer to check the network connection. The familiar "The Web page you requested is not available offline. To view this page, click Connect." Popped up. I went ahead and clicked Connect and Explorer loaded my start page just fine. There are some unique properties pages that you might need to look at if there are multiple computers on the wireless net. This means setting the operating mode, ESSID, Channel, and Authentication type to be identical to every other computer on the wireless network. In my experience with multiple computers on the net, I didn't have to touch these settings. Plug and play all the way I might say. The software that is installed along with the Adapter is just basically a monitor/configuration utility. It tells you most importantly, the signal strength and allows you change settings such as connection speed and encryption protocols. Just like I mentioned earlier, the USB wireless network adapter functions just like a conventional Ethernet adapter. There is nothing special about accessing other computers and nothing special about sharing net access. 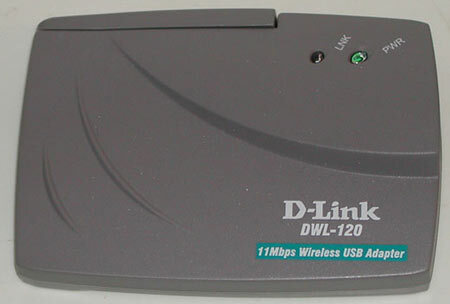 All your software will see the DWL-120 as just another Ethernet adapter. I used the kit for many things such as Internet, games, copying files, and printing. Installation on a laptop is pretty straightforward too and it also worked well. I was able to walk around the house with a laptop in my arms chatting with my friends. While watching the signal strength meter, I noticed that the signal strength got stronger with fewer obstructions in the way (duh). There are some issues and beliefs when it comes to wireless networks. One is that they don't perform as well as wired networks because people seem to think it takes longer for a signal to go through the air than it does to go through a wire. First off, even if it did in the first place, you would not even notice a difference. I didn't. Browsing felt the same, ping rates were a wee bit more but not noticeable in performance. There was no more lag in accessing computer wirelessly than in accessing it through conventional Ethernet. On a side note: using this product will not give you brain damage or cancer any more than a cell phone will. Your brain will not absorb all the data floating around your head generated from the AP because in all likelihood there is 10 times more data floating around your head from other sources such as TV stations, radio stations, phones, etc… Dispel those rumors because you will not be adversely affected by having radio signals all around. Closely watching the signal strength meter, I noticed that my average signal strength was "Very Good" at 54% while jumping down to "Good" to jumping up to "Excellent". But no matter how hard I tried, I could not get the strength to 100%, even when I put the adapter a foot away from the AP. So all tests were performed in real-world conditions at "Very Good" signal strength. As for the tests, I performed them with a host computer running Windows 2000 with a 10/100 D-Link Ethernet Card connected to a 10/100 Ethernet switch and the client connected wirelessly running Windows98. File transfer speeds are really the most important factor in determining a network for the home or office. In the first test, I transferred a 46.1MB MPEG movie of Britney Spears TO the host computer at a rate of 3.6-4.8Mbps on various tries. Transfers FROM the host to the computer was the same on most occasions, not surprisingly. 100MB of various files of various sizes transferred at a rate of 3.2Mbps-3.4Mbps, again, a good rate of speed. Although it's lower than the rated 11Mbps, it's still within acceptable and accepted limits as nothing ever really reached it's maximum speed in the world of networking. SiSoft tests were inconclusive as I got an error message saying that the transfer packet was too large for the network. This kit, affectionately called the DWL-920, is especially for desktop computers, a kit for laptops (DWL-905) is also available. Both share the same AP but the laptop kit has 2 PC Cards instead of USB devices. At $499.95, it's not a cheap toy to play with but more of a serious investment for the home network that nearly future-proof. With the USB 2.0 standard backwards compatible with USB 1.0 and 802.11 standards being backwards compatible too, this system will last you for a while. This kit makes a great choice for people who don't wish to run CAT5 cables all over the place and for people who prefer the ease of installation simplicity of a wireless network. As for my opinion, I think this is one of the greatest, if not he greatest, products I have ever reviewed. It's ease of installation combined with performance that is top notch and true plug and play capabilities made this a sure winner of our coveted Editor's Choice Award with a perfect 10 SystemLogistics. The benefits of the kit far outweigh the costs.